A hike along the Oconaluftee River Trail and a visit to the Mountain Farm Museum combines scenery and insight into Cherokee history and the lives of early European settlers. It’s a great family-friendly trek for spring. 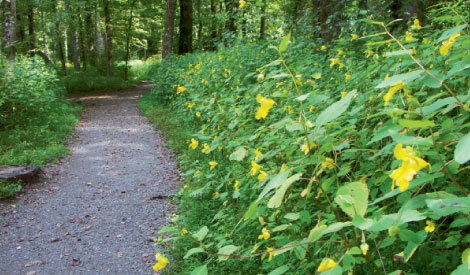 The low-elevation, gravel trail (mountain bikes and dogs permitted) departs from the Oconaluftee Visitors Center and leads through an understory of grasses, ferns, and profuse wildflowers, including trilliums, violets, and Jack-in-the-pulpits. The Oconaluftee River is narrow and fast in the Great Smoky Mountains National Park, but along this trail, the emerald green water spreads wide and dances over ledges and around islands. Half a dozen interpretive plaques explain Cherokee beliefs in English and Cherokee, and bear evocative illustrations by native artists. Benches along the 1.5-mile, one-way path invite moments of pause. Upon your return to the visitors center, take in the Mountain Farm Museum, where you can wander a flat, half-mile path and view a stunning collection of 19th-century farm structures that paint a vivid picture of the early settlers lives. Navigate: Find the trailhead behind the Oconaluftee Visitor Center, located two miles north of Cherokee on U.S. 441.